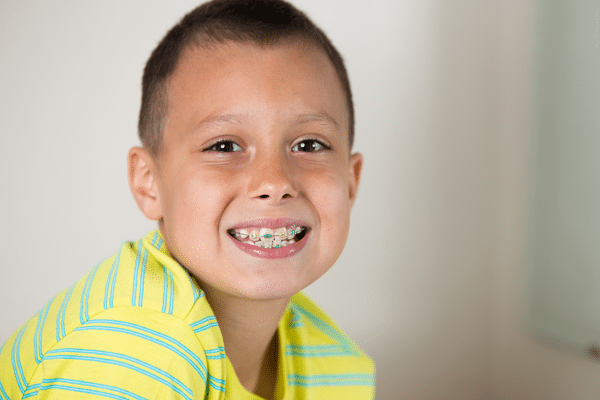 Options for orthodontic treatment used to be limited to traditional metal braces. New advances in orthodontic technology, however, have successfully created alternatives to metal braces that are becoming more popular among patients. Dr. Matthew Milestone of Milestone Orthodontics is a leading orthodontic health care provider near Rutherford, NJ and can help you determine which orthodontic treatment with braces options are most appropriate for you, your needs, and your treatment goals. Traditional metal braces are indicated in the treatment of almost all oral misalignments. Traditional braces are made of metal brackets and archwires that are affixed to the front surfaces of the teeth. Traditional metal braces can be customized to include colored bands, and some brands have found ways to slim down their bulky appearance. The cost of treatment with traditional metal braces is comparable to other orthodontic treatment approaches. Ceramic braces are similar to traditional metal braces in that they both attach to the front surfaces of the teeth. They are, however, made from ceramic and not metal. Ceramic braces are less noticeable than metal; they are made to blend in with the color of the patient’s teeth. Ceramic braces, like traditional metal braces, are worn for a prescribed period of time, and this time varies with each case. Invisalign braces are sets of clear plastic tray aligners that are an alternative to more obvious metal or ceramic braces. Comfortable to wear due to their sleek material, they are comparable in cost and treatment time to other alternatives. Invisalign aligners are removable by the wearer, and that makes eating and brushing much easier. The popularity of Invisalign clear aligners near Rutherford, NJ has increased over time. The Milestone Orthodontics team offer the most advanced and professional orthodontic treatment near Rutherford, NJ. Dr. Milestone treats his patients with the most appropriate approach for them; traditional metal braces, ceramic braces, and Invisalign clear aligners. Each treatment has their own benefits and advantages. To learn more about which option for orthodontic treatment best suits you, contact Dr. Milestone and the team at Milestone Orthodontics at: (201) 845-8411.